On Saturday, I visited the Fine Print & Drawing Fair at Lighthouse International (an organization that fights vision loss) to meet the charming and exceptionally friendly Jane Roberts, who recently hosted John Blee‘s show at her gallery in Paris. She’d traveled to New York with a diverse group of works, creating one of the most interesting booths at the Lighthouse show. The best part was the contrast between old and new, high art and unexpected pop-ups from the fashion world. I loved (and really wish I could have taken home) Karl Lagerfeld’s elegant sketches of his stylistic visions. It was very Coco Chanel-meets-French-cancan, very fun. 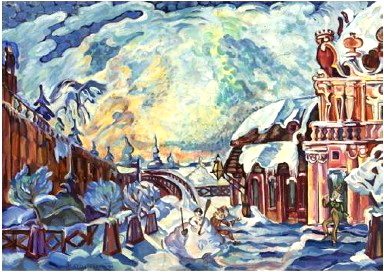 Sergei Sudeikin, “Winter Fantasy,” ca. 1920. Jane told a great love story about Sudeikin and a 20th-century femme-fatale named Vera. The two fell in love and Vera (already twice-married) ran off to Paris to be with Sudeikin. The poor guy left his wife and move to St.Petersburg with Vera – and then to many other places as they sought to escape Russia’s political mess and follow their artistic dreams. But the beautiful, passion-hungry Vera (whose looks could even stop thieving pirates in their tracks) wasn’t satiated. When famous Russian composer Stravinsky invited Vera to a piano-dress rehearsal that Sudeikin instructed her not to attend, Vera left Sudeikin for Stravinsky. You can read BBC’s portrait of Vera here. I happen to own that same Karl Lagerfeld sketch. My father worked as a photographer for that collection and I recently found a folder with it and some photographs. I went to the link you posted but I didn’t find it, must have been sold since.